At Growth Energy’s fifth annual Executive Leadership Conference, the No. 3 American Ethanol Chevrolet SS was unveiled by Growth Energy Co-Chair Jeff Broin, Growth Energy CEO Tom Buis, Growth Energy Board Member and special guest Richard Childress and NASCAR Sprint Cup Series driver, and 2013 NASCAR Nationwide Series Champion, Austin Dillon. The No. 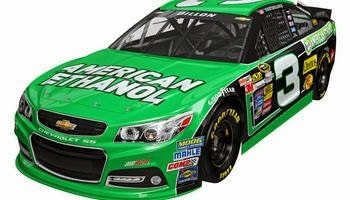 3 American Ethanol Chevrolet SS will debut in the “The Profit on CNBC” 500 at Phoenix International Raceway on Sunday, March 2nd at 1 p.m. (Mountain Standard Time). "American Ethanol is extremely pleased to once again partner with Austin Dillon, Richard Childress and the entire RCR team to help promote a sustainable homegrown American fuel that is better for our environment, reduces our dependence on foreign oil and creates jobs right here in the U.S., while revitalizing rural economies across America and saves consumers at the pump," said Tom Buis, CEO of Growth Energy. Through American Ethanol, Growth Energy has been a long-time sponsor of Austin Dillon and Richard Childress Racing. Growth Energy is also a partner with NASCAR Green. By supporting the Sunoco Green E15 racing fuel, Growth Energy and NASCAR are both dedicated to reliable, home-grown, renewable fuel that is environmentally friendly.